The download contains a zipped .exe file which is the application itself. The application self-installs and un-installs without the aid of an external installer. In order to run in portable mode: create a blank file in the same directory as the .exe named "prefs.ini". When launched, the .exe checks for the presence of this file and indicates "portable mode" in the window title. It also looks for/creates a library directory (Default Library) in the same directory as the .exe. When in portable mode it does its best to avoid writing to the system. However, it relies on certain portions of IE to do HTTP requests and HTML rendering and despite explicit flags to prevent caching/history it nonetheless leaves a little bit of a trace behind. It has full Unicode support. In testing with my 256MB USB2.0 stick, it runs rather slowly when performing loads. It does quite a bit of r/w access to the library which the stick doesn't seem to like. Larger ones may fair better. My recommendation is to do any loading on the home computer and copy the library to the stick as a portable,searchable internet library. This app is rather unique and unlike anything I have seen before. I have put it in my PStart list to see if it is useful enough to work itself into my daily routine. Thanks! I am the author and am open to any feedback you might have. I am curious if it runs any better on larger memory sticks. I was rather disappointed that it runs really, really slowly on my 256mb version because I think it could be pretty useful as a portable app. There's are also many hidden features which I'm slowly making visible as I figure out how to present them in the UI without making it any more confusing and jumbled. Please let me know if there's any features you think are missing that would be very useful. It might already be in there. substance21 wrote: Please let me know if there's any features you think are missing that would be very useful. It might already be in there. A thumb of the page found would be neat (instead of the magnifying glass that opens the preview pane). ahha! This is one of those features that's already in there but just hard to find. Try tapping the + key a few times with a search result selected. The magnifying icon should be replaced by a thumbnail and will keep growing as you hit + more. The - key will do the opposite and eventually turn the thumbnail back into a magnifying glass. This is the official forum topic for Fact200, a minute trident (Internet Explorer's browser engine) based "Internet Research Tool". [url]http://www.fact200.com/[/url] author wrote: Fact200 is both an Internet search client and a news feed reader that concentrates on finding, sifting, and browsing information while filtering out noise and junk. It is ideal for browsing through massive amounts of web pages (e.g., browsing news feeds) or for researching esoteric subjects. 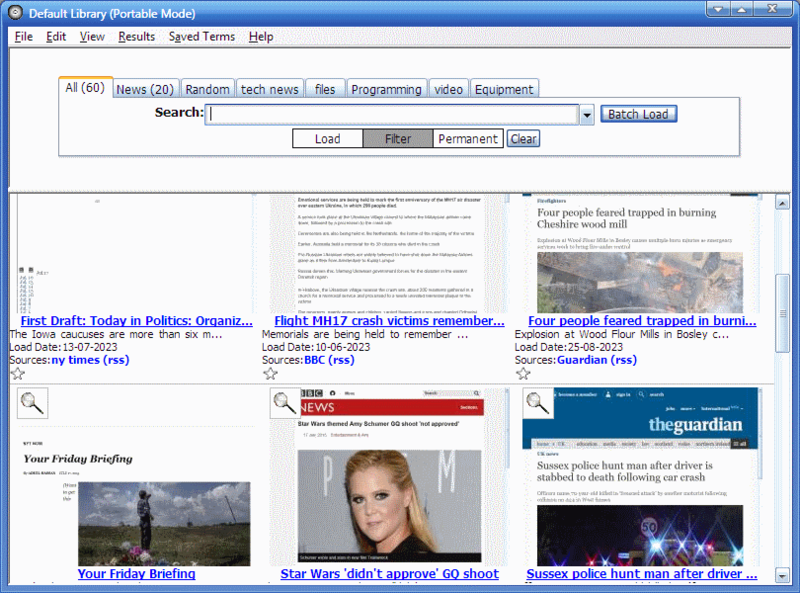 View Flash movie demos of searching and news reading to see how it works. Fact200 last release (v1.10) can be downloaded from http://www.fact200.com/download.html.